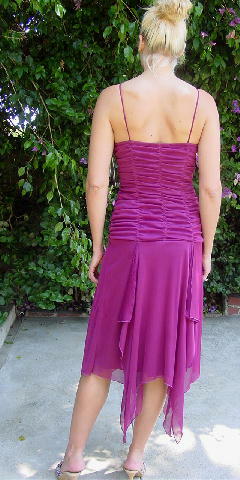 This never-worn (except for these pictures) spaghetti strap red-wine color dress is by Rampage Clothing Company. It's 100% polyester and was made in the USA. The front has a V neckline with ruching on the front and back top half section. It has a full lining in a magenta-grape. The lining fabric has some stretch to it. The outer skirt fabric is somewhat sheer and has a scarf effect. The tag says size M, but it fits more like a size 6/8. front center to bottom center (scarf) 34"
front center to bottom center (lining) 33"